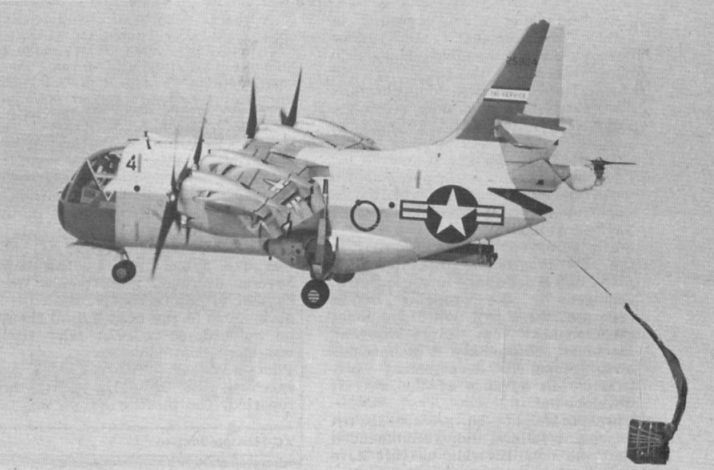 An XC-142A with Stuart Madison at the controls, hovering over the Vought runway before a roadside audience. 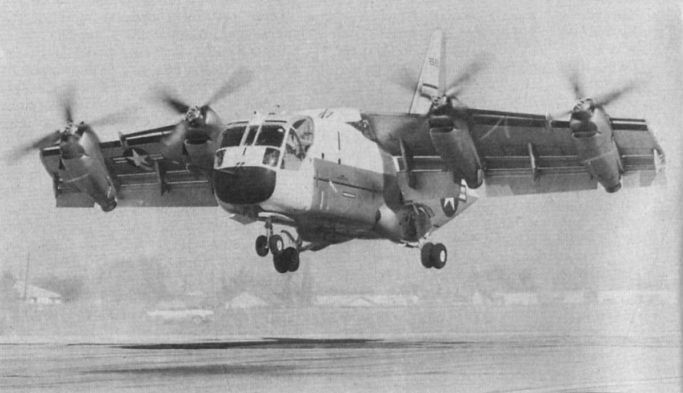 25925 making a Stol take-off from the USS Bennington in 1966. 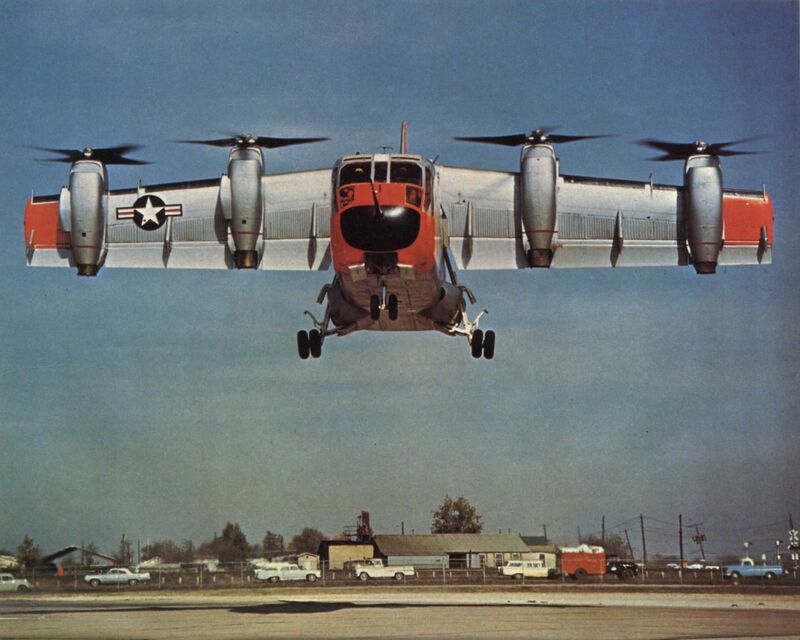 The first flight of an XC-142A, made by 25922 on September 29, 1964. 25924 in the blue and white livery applied for the 1967 Paris Air Show. 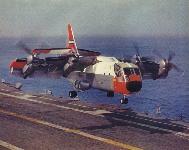 Although 25921 was the No 1 aircraft, it was not the first to fly, this honour falling to the second machine. No 1 crashed on May 10, 1967, killing its crew. The third XC-142A, 25923, hovers nose to nose with another in front of the Vought control tower, Dallas. 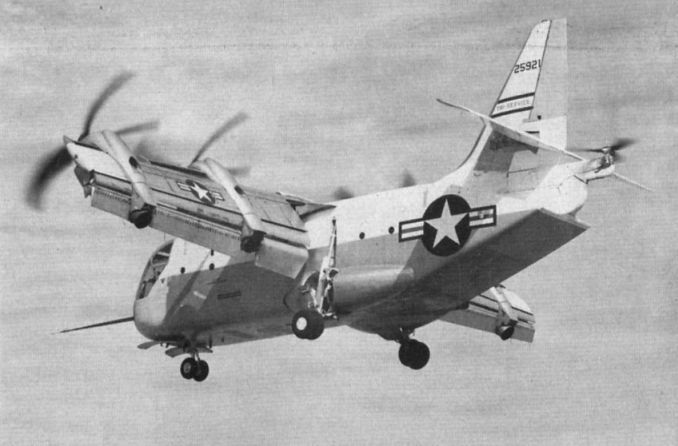 This aircraft was damaged in a hard landing at Edwards AFB on January 3, 1966. 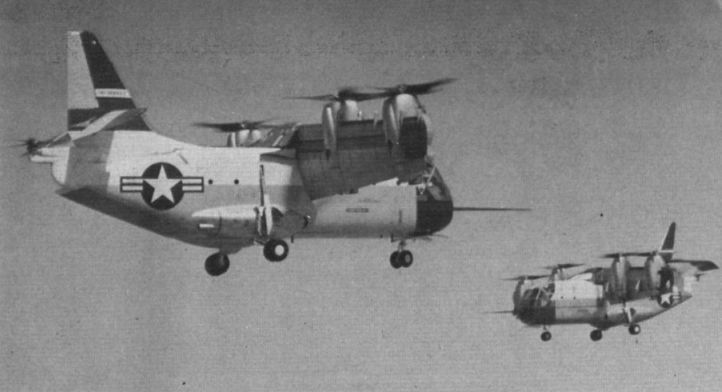 A view of the first aircraft during transition, showing horizontal tail propeller. 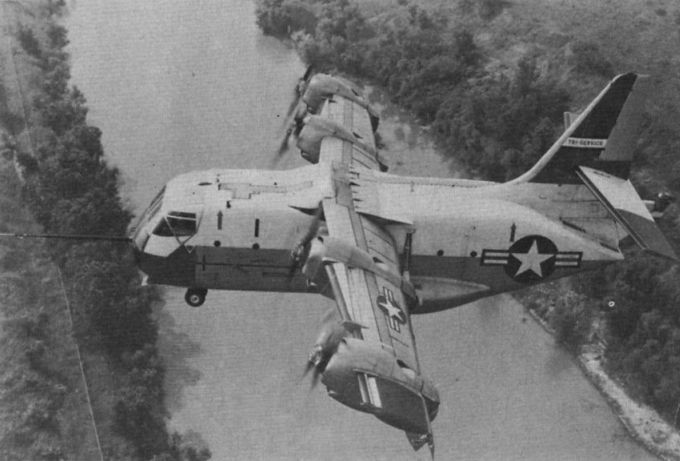 25921 over swampy terrain at Mountain Creek Lake prior to a Stol landing at the Vought plant. Hovering nearly vertically, an XC-142A "rescues” a dummy from a lake near the Vought factory at Dallas, prior to making live rescues to test the aircraft’s capabilities in the air/sea rescue role. Another dummy rescue, showing the capacious fuselage and rear loading doors to advantage. 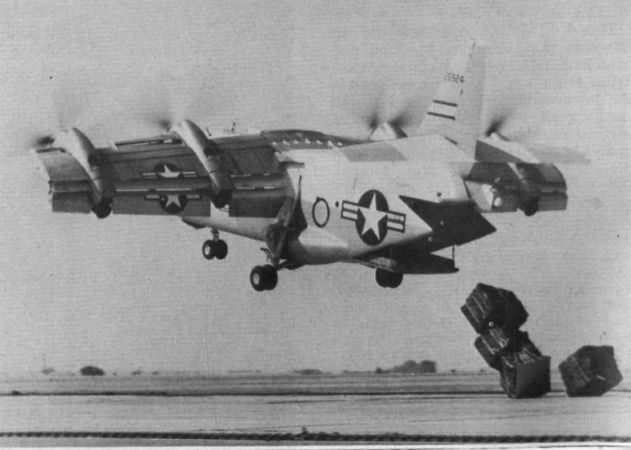 25924, with its wing at 35°, unloads four 1,000lb pallets over the runway at the Naval Aerospace Recovery Facility, El Centro, California. 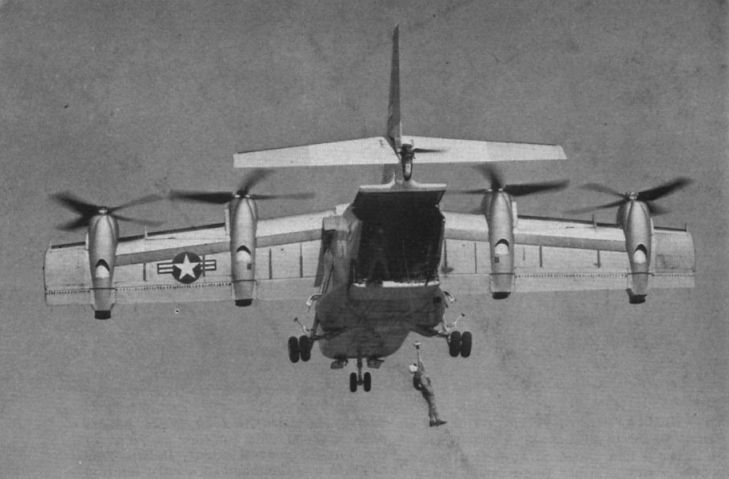 25924 earlier in its life, dropping a cargo container over the El Centro parachute test range. 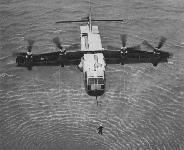 John Omvig was the pilot. 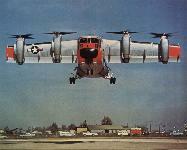 With its self-made dust storm in train, the No 1 XC-142A makes a Stol landing on a concrete runway. Note the extensive trailing edge flappery and leading edge slots. 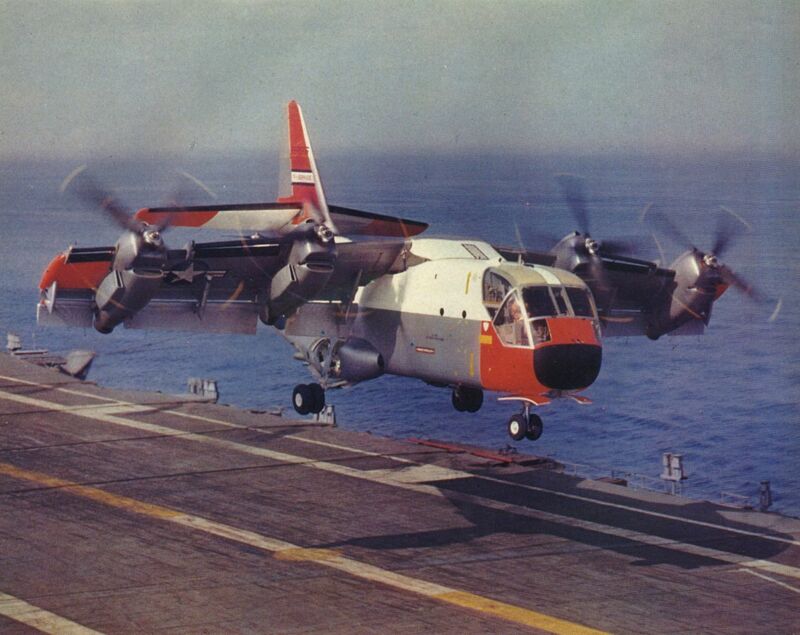 25925 touching down in a Stol landing aboard the USS Bennington. 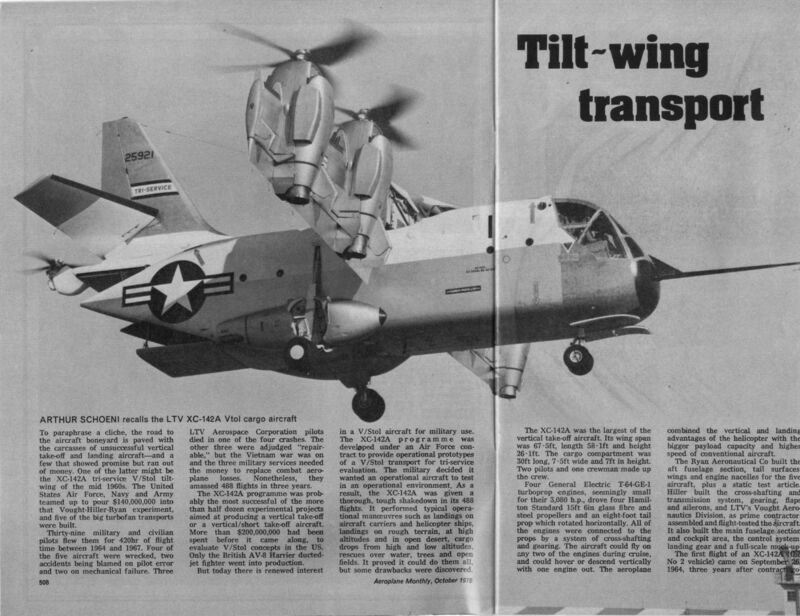 Lt Rich USN, and Maj Larsen USMC, made 44 take-offs and landings during these trials, both in the Stol and Vtol mode, proving the aircraft’s carrier potential. 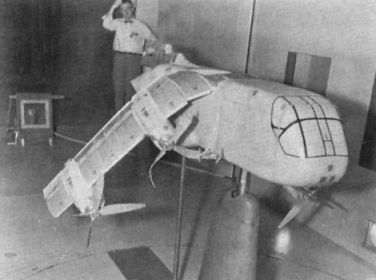 An engineer in Vought's low-speed wind tunnel contemplates a model which suffered wing failure during test.